How do you hide on an exposed reef flat? Just ask a razorfish! Green razorfish (Xyrichtys splendens) are in abundant in the shallow sand flats and sandy seagrass beds from Bermuda all the way to Brazil. 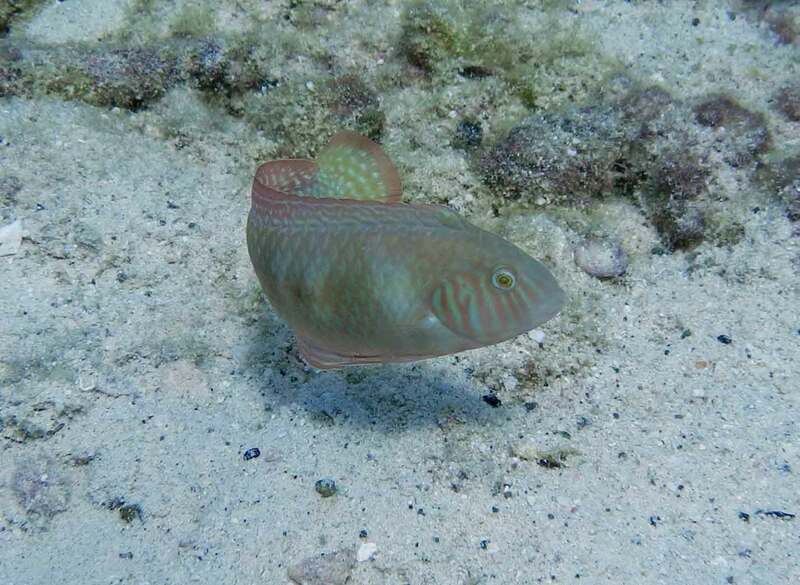 Razorfish are a genus of wrasses named for their thin, flat bodies and sharp, protruding foreheads. This “razor-like” build allows them to “sand dive” when predators are near, burrowing into the sand at the first sign of danger. Their coloration also helps them hide in seagrass beds- they change their hiding behavior based on the habitat where they are living. They also typically live in colonies, which helps them stay vigilant for predators. These adaptations that keeps them safe from piscivores (fish eating animals) on otherwise exposed sand flats.